The background of my computer is my brother's Army picture, as such. Often, when I'm working on my computer on a plane, a stranger will lean over, and ask me if this is my husband. 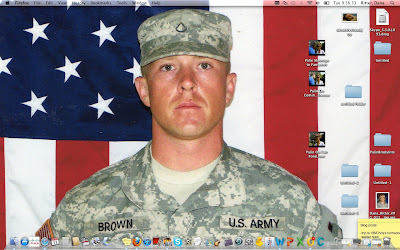 I explain, no, he's not my husband, he's my little brother, and he's serving in Afghanistan right now. They tell me to thank him. He is my soldier. A little over a week ago, I got to do one of the coolest things I have experienced. Welcome my soldier home. 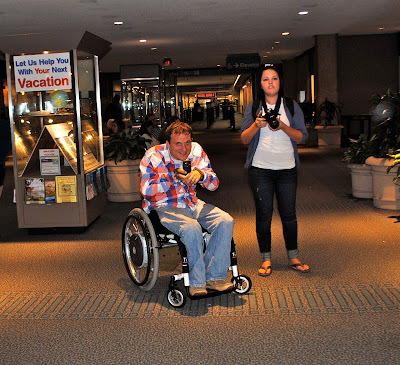 We were totally that family at Norfolk International Airport. And the crying, clapping crowd. 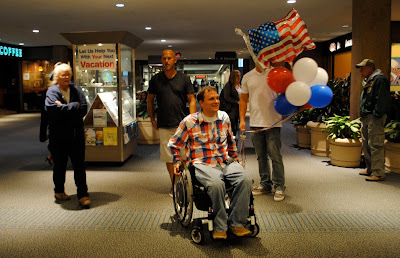 Would you believe, when Chris got off that plane, and saw us standing there with balloons, a big "Welcome Home Chris" sign, and a lot of his friends and his whole family... he started walking into Starbucks like he didn't know us!?!?! My mom pretty much started to chase him down. My favorite part of the whole thing - hearing so many people in the airport start clapping. They saw what was happening, and put their bags down and put their hands together for SGT Chris Brown!! I couldn't have been prouder of my brother. This is Chris watching the video I made for his 30th birthday, which happened in August when he was in Afghanistan. I loved watching him watch it for the first time! The time we got to spend together was priceless. I got to see him some more a few days after his big homecoming. More on that, soon. Please continue to pray for Chris and all of his men. 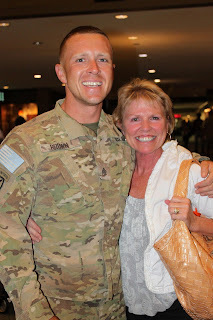 Chris has to go back to Afghanistan too soon, for 6 MORE MONTHS, ugh. His guys are all cycling through their leave right now. Please pray for all of them that they are rested, refreshed and encouraged and ready to get through the rest of this deployment! 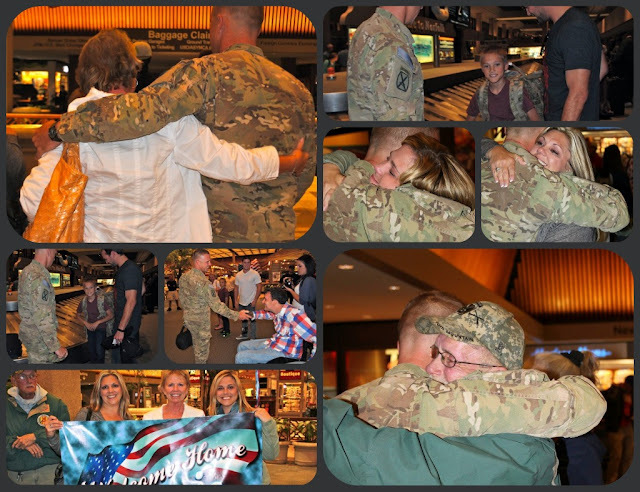 SO fun to see these pictures and hear about the welcome home scene at the airport! 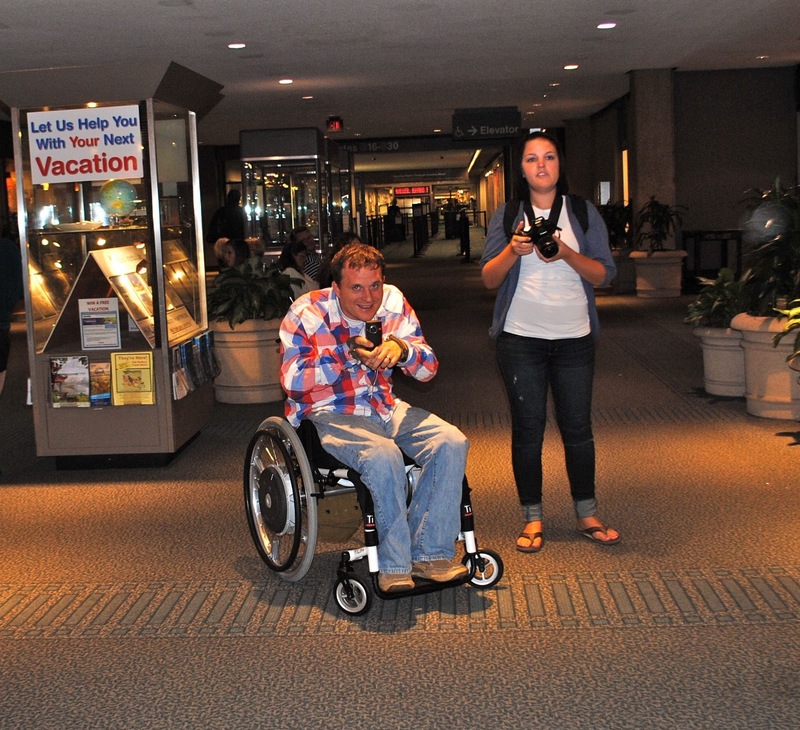 I'm just happy to KNOW someone who is "that family" at the airport! I would love to be one of those bystanders cheering and saying thank you! So, so proud of Chris and his service to our country . . . thanks for sharing, Dana.